A confidential report, intended only for those who are serious about the mental profession. 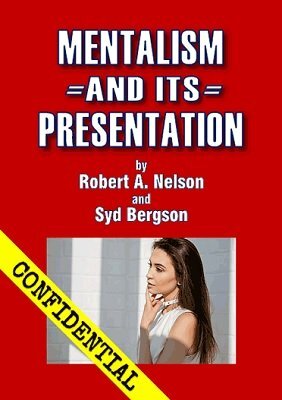 Learn the correct techniques of presentation, teaching what to do and what not to do for successful mentalism. A must-have book for every mentalist and magician. These lessons will make you a better performer, enhance your reputation as an unusual entertainer and enable you to collect higher fees. THE SERIOUS BUSINESS OF MENTALISM - Mentalism as a profitable business - The Mentalist's Sole Aim - The Effort to Deceive - The Challenge to the Spectator - Mentalism vs. Magic - Perfection and Effort. APPROACH TO MENTALISM - Mental attitude - Present day mentalism. The role of the mentalist. Initial audience reaction. Self-analysis, correct props and accessories. When playing cards are acceptable to mentalism. Requirements and other factors. FACTORS TO RECOGNIZE - The two types of mental work. Acquiring a repertoire. Versatility. Ingredients for a successful program. FURTHER THOUGHTS IN MENTALISM - How to neutralize suspicion. Presentations that are compatible with the audience. When presentation is more important than methods. THE BUILD-UP - Your initial contact with the public thru a build-up. Names, titles and slogans. Pitfalls to avoid. The direct approach. Publicity, brochures and other printed medium. Your initial presentation. PUBLICITY AND PROMOTIONS - Prestige stunts. Predictions, locked safe psychic tests and others. Committee tie-ups. YOUR PROGRAM - The most effective type of presentation. Audience acceptability, entertainment value and IMPACT. PROGRAMMING - First impressions. Introductions, dynamic action. Best method when introductions are made by others. Audience cooperation. Proper sequence. Timing. Climax. Length of program. Committees. Conditioning the audience. PROGRAMS OF FAMOUS MENTALISTS - A breakdown or programs as performed by famous mentalists. A helpful guide to planning. PRESENTATION - Importance of patter presentation. Dramatization and every effect a "miracle." Distractions and how to command attention. Attaining a smooth running mental vehicle. Situations to avoid. Sensational examples of impact mindreading. Confirmations. Audience participation and how to handle. COMEDY RELIEF - The importance of same. How to achieve. Working examples. When not to be a comedian. PSYCHIATRIX - A brilliant, original creation by Syd Bergson that will convulse any audience with laughter, yet jolt them with a smash climax. A perfect comedy relief mental routine that you can make for a few cents. Worth more than the price of this entire book. PATTER LINES - Lead-in lines. Introductory remarks. Quotes. Suitable patter material for practically any mental effect. And more. Including two new chapters available only in this digital edition. Are you a Nelson collector? This effect was listed as No. 675 in the Nelson Enterprises catalog . "I am delighted with this book. I found it to be most helpful; truly an excellent book." - W. W. Pharr, Jr.